Parliament is to be given a take-it-or leave-it vote on the final Brexit deal before the UK leaves the EU. 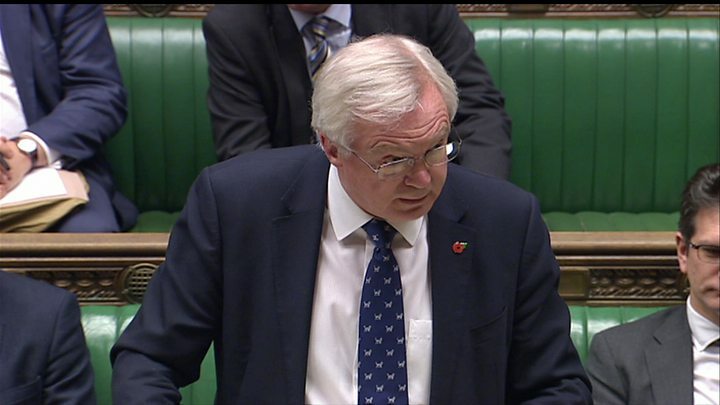 Brexit Secretary David Davis said the terms of the UK's exit, such as money, citizen rights and any transition must become law via a new Act of Parliament. Labour welcomed a "climbdown" but some MPs warned of a "sham" if ministers could not be asked to renegotiate. Sources have told the BBC some Tory rebels were unimpressed, with one saying the promise was "meaningless". BBC political editor Laura Kuenssberg said the announcement was significant because it represented a big concession to potential Tory rebels and Labour MPs at a highly important moment in the Brexit process. It comes as MPs prepare to debate key Brexit legislation later this week with the government facing possible defeat on aspects of the EU Withdrawal Bill, which will convert EU law into UK law. The UK is due to leave the EU in March 2019, irrespective of whether MPs back or reject the terms of the deal negotiated by Theresa May's government. But updating MPs on the sixth round of talks which concluded on Friday, Mr Davis told MPs they would still play a major role and "there cannot be any doubt that Parliament will be intimately involved at every stage". The government had previously agreed to give MPs and peers a vote on a Commons motion relating to the final Brexit deal - before it has been voted upon by the European Parliament. A confident government wouldn't have conceded like this the day before the Brexit debate was due to come back to the Commons in earnest. This climbdown does not remotely mean that other grievances over the existing Brexit legislation will disappear. It doesn't mean that the next few weeks will suddenly become plain sailing. And if there isn't a withdrawal deal with the rest of the EU, well, then there can't be a bill that covers the withdrawal bill. It's only in the coming days that the government will know if they have done enough to get the existing plans through. And the move also of course adds to a massive load of complicated Parliamentary business that has to be cleared before we actually leave. Mr Davis said he still "intended and expected" this to happen but went further - agreeing to Labour and Tory MPs' demands for any vote to take place on substantive primary legislation, which would allow MPs and peers to amend the bill before it became law. The bill, he told MPs, would contain the contents of the withdrawal agreement that the UK hopes to seal in time ahead of its scheduled departure and all key aspects of it - such as the financial settlement between the two sides, the future status of UK and EU citizens and the terms of any implementation period. "This means that Parliament will be given time to scrutinise, debate and vote on the final deal we strike with the EU," he said, adding that it was not clear when such a bill would be published. Labour's Keir Starmer said it was a "significant climbdown from a weak government on the verge of defeat". "With less than 24 hours before they had to defend their flawed bill to Parliament, they have finally backed down," the shadow Brexit secretary said. "However, like everything with this government, the devil will be in the detail." Labour's Chris Leslie said what "could have been a very welcome concession instead looks like a sham that pretends to respect the sovereignty of Parliament but falls well short of what is required". The Lib Dems reiterated their call for the final deal to be put to a referendum while several Tory MPs questioned what would happen if a deal was only agreed at the last minute before the 29 March deadline - a scenario Mr Davis has suggested was conceivable - and MPs could only vote after exit. Dominic Grieve, the Conservative former Attorney General, said this would not be acceptable and if time ran out then negotiations with the EU should be extended "so all parties are able to deal with it". And Conservative MP Antoinette Sandbach pressed Mr Davis to reassure MPs how "if the bill intended to ensure a meaningful vote only comes forward after that date, the vote is in any sense meaningful". Mr Davis responded by saying MPs would have the opportunity to say "either you want the deal or you don't want it" and if the UK and EU could not agree a deal, there would be no legislation. But, in a meeting with the Conservative chief whip, a group of about a dozen Tory MPs expressed anger at the government's plans, sources have told the BBC. One of the MPs, Anna Soubry, said the idea of a Brexit Act of Parliament was "'insulting… it sounds in theory very good but there's no guarantee". She suggested that the promise was "meaningless" and that the government is in "grave difficulty" over passing its Brexit legislation in the coming months.